An Illinois Digital I.D.Java will be required for all of these computer functions to work correctly. To find out if you have the current Java click on this link and then click on “verify java version” to find out if you have Java. AGAIN – YOU MUST HAVE JAVA LOADED ON YOUR PC.Visit the Illinois Digital ID website to obtain a digital ID. NOTE: A separate website link is available if you have forgotten your Illinois Digital ID. username and/or password. If you have questions, visit the Illinois Digital ID website FAQ page or call the Central Management Services Help Desk at 1-800-366-8768 for assistance with the Digital ID. Questions regarding the Concealed Carry License application process should be directed to the Illinois State Police at 217-782-7980. Fingerprints – Electronic fingerprints will expedite your application! Specify to the Live Scan vendor that your fingerprint application is for the Concealed Carry application (ORI = IL920707Z, Purpose Code = CCW).NOTE: Applicants will be assigned a transaction control number (TCN) at the time of fingerprinting and will be required to retain that TCN to complete the application. NOTE: If you have questions, visit the Illinois Digital ID website FAQ page or call the Central Management Services Help Desk at 1-800-366-8768 for assistance with the Digital ID. Questions regarding the Concealed Carry License application process should be directed to the Illinois State Police at 217-782-7980. How will ISP officers and local law enforcement respond to citizens who are carrying weapons after July 9th? The Illinois State Police will continue to enforce the law in effect after July 9, 2013. Assuming the law is either the version passed by the General Assembly or that amended by the Governor; citizens cannot lawfully carry concealed weapons without a valid Concealed Carry License. Citizens who carry loaded firearms without a Conceal Carry License issued by the Illinois State Police are subject to arrest. All citizens seeking to obtain a Concealed Carry License must have a valid FOID card. Who needs a CCW license? Everyone who wants to carry a concealed firearm in Illinois is required to have a CCW license except current peace officers and retired police officers eligible under the Illinois Retired Officer Concealed Carry (IROCC) Program. Retired officers may be eligible to carry under either the IROCC Program or the new CCW law. No. Out of state residents must obtain an Illinois Concealed Carry License to lawfully carry a concealed firearm in Illinois. In order for out of state residents to be eligible for an Illinois license, their state’s concealed carry license laws must be substantially similar to those of Illinois. The Illinois State Police will establish rules to identify the elements necessary to meet the substantially similar requirement. What is the cost for a Concealed Carry License? How does a citizen apply for a Concealed Carry License? When will the applications be available? Where can applications be obtained? The ISP has 180 days to make applications available to the public. The ISP intends to have applications available via the ISP webpage. How long will it take a citizen to obtain a Concealed Carry License? The ISP will comply with the mandates of the Act. The application will be available within 180 days of the effective date and licenses will be issued 90 days after a qualified application is submitted. Law enforcement agencies will have 30 days to file an objection. What are the qualifications for a Concealed Carry License? ◦A misdemeanor involving the use or threat of physical force or violence to any person within the last 5 years. ◦2 or more violations related to driving while under the influence of alcohol, other drug or drugs, intoxicating compound or compounds, or any combination thereof, within the last 5 years. Within 60 days of becoming law, the Act mandates the ISP to begin approval of certified firearms instructors and firearm training courses. The ISP website will provide a registry of instructors and approved classes. PLEASE NOTE: On-duty ISP Troopers will NOT provide training to citizens, nor will ISP ranges be utilized. •Be a legal resident of the United States and be qualified for a concealed carry permit within Illinois. •Possess a high school diploma or GED certificate. ◦Certification from a law enforcement agency. ◦Certification from a firearm instructor course offered by a state or federal governmental agency. ◦Certification from a firearm instructor qualification course offered by the Illinois Law Enforcement Training Standards Board. 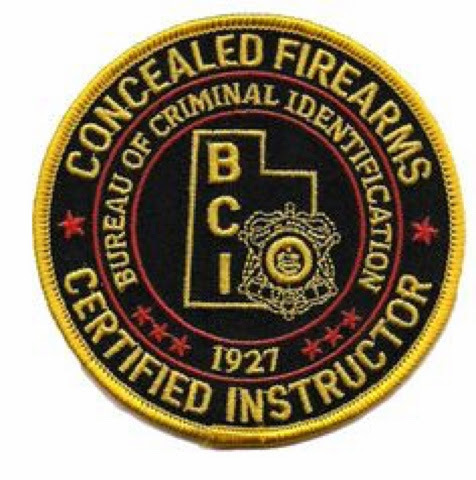 ◦Certification from an entity approved by the Illinois State Police that offers firearm instructor education and training in the use and safety of firearms. How can I register as an instructor? The Illinois State Police will establish rules consistent with the provisions of the Act. As additional information regarding the rule making process becomes available, updates will be posted to our website. Where can business owners or property owners obtain information regarding required signage? The Illinois State Police will establish rules consistent with the provisions of the Act. As additional information regarding the rule making process becomes available, updates will be posted to the ISP website. Illinois residents wishing to purchase, possess or use firearms generally must have a Firearm Owner’s Identification card. You can download the most current application from the Illinois State Police website Here. There are exceptions to this “must have FOID card to touch a gun/ammunition” rule, including one for individuals receiving firearm training instruction from a FOID cardholder, but generally speaking, you need to get one if you don’t have one yet. Your spouse / significant other / kids / grandkids should all have a FOID cards as well, to preclude issues of them borrowing your car with a gun and/or ammunition inside. Even a single .22 caliber rimfire cartridge rolling around under the seat can spell big trouble for your loved one should they run into the wrong police officer / sheriff’s deputy. Illinois does not have conventional carry of firearms as forty-nine other states do. We have something called “fanny pack carry” which is (please suppress your giggles) the carry of an unloaded, encased firearm by a FOID card holder. .
Don’t take our word for it. Browse the Illinois State Police website’s document library. Download the Illinois State Police “Transport Your Gun Legally” flyer. Print it out and put it in your fanny pack or other case where you transport your firearm. I want to share a story from hunting season’s gone by. On opening day the rifle my friend was using had been dropped, unknown to us at the time the scope had been damaged causing its point of aim to be thrown way off. As our day continued my hunting partner, several other friends and I were trying to find a buck that was wounded in a slough. I was helping push the slough with two of our friends when this buck ran out of the slough straight towards where my hunting partner was posting. He took aim with his rifle, and missed, by where his round hit the dirt it was way off, this buck continues to run towards him, he drew his .357mag with his off hand and fired. At a distance less than 5 yards bullet struck that buck, causing it to skid into the dirt. My hunting partner assumed a textbook combat stance when he shot the buck with his pistol with out aiming. Now as I think back about that day this is one of those stories, if I had not personally witnessed I may have doubted weather it truly happened. How does a person become skilled in the use of a pistol for defensive/combats shooting? First we must start with the basics; the first step is forming the grip on the pistol. A good grip will aid in all types of shooting styles and positions. Establishing your grip on the pistol starts when you begin to draw the pistol from your holster before releasing any retention devices. When forming the grip, you need to ensure you are gripping the pistol high enough on the back strap. The best way to describe the pressure of a good grip is like a firm handshake. If you apply too much pressure with your little finger it could cause your shots to go lower than your point of aim. Your grip must be uniform in pressure while not so firm it interferes with the movement of the trigger finger. The grip must center the pistol in your hand it is like an extension of your arm. A proper grip will not allow the pistol to shift in your hand when the shot breaks. When gripping the pistol the pressure should be straight to the rear and remain constant while pressing the trigger. The next step is the draw sequence; most people who go to the range and practice do so with the pistol in an exposed holster. 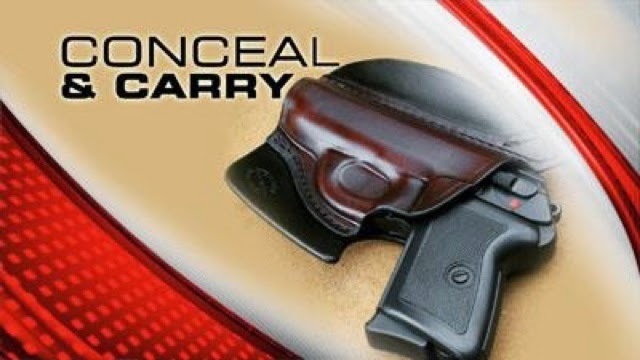 It is my opinion the person who chooses to carry a concealed pistol for self-defense should practice with their concealed carry holster they plan on using. By practicing with your concealed carry holster you are developing your muscle memory. Clearing your concealed pistol to draw-To clear your shirt reach down with your non-shooting hand grab the bottom of the article of clothing lifting straight up till your pistol is cleared. To clear an unbuttoned or unzipped coat you can sweep the article back away from your holster as part of the draw stroke. This should be practiced to so you know which draw works best with your chosen wardrobe/pistol/holster system. When drawing your pistol, lift the pistol straight up till it clears the top of the holster. Rotate the muzzle forwards till the muzzle is pointed down range and your wrist/forearm rests against your side. Keep your finger off the trigger, lying along the side of the frame. This is one position the weapon can be fired from in extreme close combat firing, and point shooting 1-5 yards. This also gives you more control over your pistol in case the suspect attempts to grab it from you at this point. Remember to keep your non-shooting hand in away from the muzzle at this point. If you are forced to use your non-shooting hand to defend yourself remember to keep it clear of the muzzle to avoid injuring yourself. Hand Positions of two handed grip – Bring your shooting hand & non-shooting hand forward to the center or front of your body to form you two handed grip. The shooting hand should have the trigger finger should be on the side of the pistols frame operating independent of the rest of the fingers. The remaining fingers should be as high as possible on the front strap of the grip while the web of the hand should be as high as possible on the back strap of the grip of the pistol. The non-shooting hand should completely encircle the shooting hand bringing the heels of both hands together. As much of the grip surface should be covered as possible, using this method will aid the shooter in controlling recoil. If possible the index finger of the non-shooting hand should be under the trigger guard. This will help unintentional down ward pulling during the trigger stroke. Follow though- bringing the pistol forward and up to eye level utilizing a push-pull effect with the shooting hand pushing, and the non-shooting hand pulling to maintain a sight picture. Remember, when using contact shooting, extreme close quarters shooting, and point shooting, you can fire your pistol without the aid of using the sights and generally hit center mass. During a contact shooting, it is recommended to immediately break physical contact with the assailant. If a shot has been fired it is recommended you cycle your pistol in the event of a malfunction After disengaging prepare to follow-up at a more suitable target area, if the assailant continues the attack. Distances are usually 0-1 yards. Disadvantages are the high possibility of causing a stoppage during the event. ECQST from near contact range to 1-3 yards. These are engagements where the pistol cannot be brought to the eye level or where you would not want to bring it to eye level due to the possibility of being disarmed by assailant. This form of shooting can be utilized from the holstered and ready gun positions, with both single hand & two-handed grips. You should also be able to deploy various levels of defensive tactics to counter sudden deadly force encounters. While firing the pistol it should be held in close to the body to stabilize it while firing. Your body’s stance should be a combat or fighting stance. Keep in mind this is to be used in “fistfight” distances requiring the use of deadly force. This method should be used till you can break contact enough to follow up with aimed fire or the threat of deadly force from the assailant has stopped. Point shooting is generally from 3 to 7 yards. The method should be as follows: The pistol is held at line of sight. Your focus is on the threat, or a specific visual target point on the threat. Focus is not on the sights, point shooting is successful due to muscle memory developed by training and practice you are able to perform this shooting stance with proficiency. Remember you may not have fine alignment of the sights but nevertheless in your mind’s eye, you can bring your pistol to bear indexing with your hand eye coordination to aim. This is a basic form of point shooting where you may or may not use the sights. It is my opinion that a person learning to use a pistol for self defense should learn to shoot from all positions using both aimed and non-aimed fire. This should instill confidence and ability in their skill to use handgun to defend them if faced with a deadly force situation. It is in these sets of circumstances, speed, confidence and the ability to use your handgun from ether hand in any position with or with out the use of sights is crucial. Matt Schlueter is a retired Deputy Sheriff from South Dakota with over 19 years of combined experience in corrections and law enforcement, and held the position of Firearms Instructor and DARE officer with the Sheriffs Office he worked at till his retirement. He is also a NRA Certified Pistol Instructor, and owner/chief instructor of Schlueter Firearms Instruction. Matt’s goal is to provide the best information possible for those who want to further their knowledge and skills in shooting handguns. Matt’s goals also include providing the best training courses possible for students who attended courses he is offering. Why get multiple Conceal Carry Permits / Licenses? Should You Get Multiple Concealed Carry Permits? The first thing that every American (who is able to) should do is go get their concealed firearms permit. Even if you never plan to carry, or don’t carry often, at least once you get your permit you have the option to protect yourself. And, if you happen to be one of the poor souls who lives in a state that has unfriendly gun laws and you can’t get your CCW, then move. I’m very serious about that. I bring this up because my wife’s family lives in California. I have let her know without a doubt we will never be living in that state. I can think of few things worse in life than not having a gun on me to defend my family because I chose to live in California or Maryland or New York. However, once you’ve got your permit for the state you live in, many people often wonder if they should get additional permits. In short, I believe the answer is yes. Right now in my wallet I have my Virginia permit and my Utah permit, which combined allow me to carry concealed in 33 states. Why do I have multiple permits and why do I think you should too? Well, the first and most obvious reason is because different permits provide coverage for different states. For instance, Virginia has reciprocity with Florida and Utah does not. (They don’t have reciprocity for non-resident permits.) I used to travel to Florida often, so I definitely needed a permit which would allow me to carry in Florida. Also, Utah has reciprocity with both Alabama and Georgia and Virginia does not. Another reason I carry multiple permits is because it’s kind of like insurance. You never know what foolish politicians are going to do even in gun friendly states like Virginia and Utah. So, if something happens where one permit loses coverage on a lot of states, or becomes much more difficult to obtain at least I have my “back up” permit. Not only do you have to worry about the state which issues your permit, you have to worry about all the states that grant it reciprocity. Reciprocity coverage is always changing when new politicians get elected or when states get in a “urinating” contest over something and decide to no longer recognize each other’s permits. A friend of mine probably put it best when he told me that he carries multiple credit cards such as Visa, American Express and Mastercard to have “back up” cards and various options, which is how he feels about carrying multiple permits- he wants several options, and I couldn’t agree with him more. So if you’ve been sitting on the fence about getting another permit, or you’ve been too cheap to spend $65 on another permit that will last you for 5 years, then as soon as you finish reading this, take action today and sign up for a local concealed carry class in your area. Jason R. Hanson is a former CIA officer. He’s also an NRA Certified Instructor, a Utah Concealed Firearms Permit Instructor and an Eagle Scout. Jason believes there are few things in life as important as being able to protect yourself and your loved ones. That’s why he’s giving away a free report titled, “Insider Secrets of Buying Your First Concealed Carry Firearm” at www.ConcealedCarryAcademy.com. 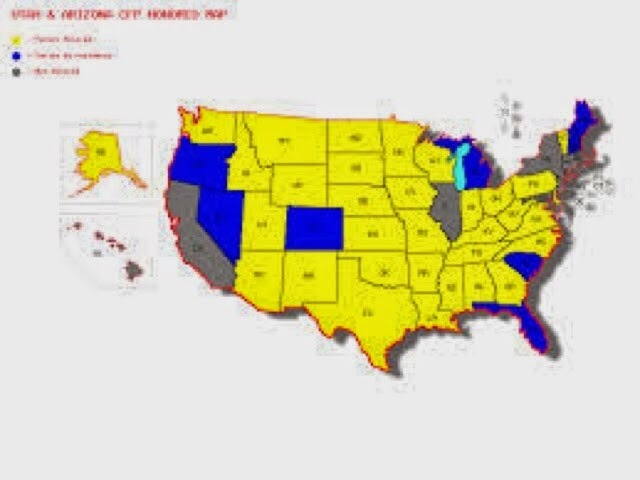 $50 - Get your non-resident Utah & Arizona CCW licenses / permits and conceal carry in over 33 States! Let’s say you’ve traveled somewhere to take a rifle or a pistol course. At the end of the course you have some ammunition left over and you need to get it back home. First, you can fly home with it. You are allowed to have 11 pounds of ammunition per checked bag. Whenever I fly with ammunition I simply keep it in the carton that the ammo came in when I purchased it. Flying with ammo in your checked luggage is a piece of cake and I’ve never had a problem doing it. But, what if you’ve got more than 11 pounds of ammo? Or what if you don’t want to put it in your checked bag? The second option you have is to ship the ammo via Fed-Ex or UPS. You cannot ship ammunition through the US Postal Service so don’t even try or you could get in serious trouble. 4. You must take the ammunition to a shipping center, not a regular UPS store, where they’ll check your package in and get it where you need it to be. So, the next time you end up with ammo in one location and you need to ship it home, don’t worry… it’s an easier process than most people realize. Jason Hanson is a former CIA Officer and author of The Covert Guide to Concealed Carry. I’ve never sent a text message before in my life. I realize that in today’s world this sounds unbelievable or bizarre but there are three important reasons why I’ve never done it and never will. 1. Situational Awareness - How many people do you know that walk around with their head down texting every chance they get? How many times have you been stopped at a light and the guy in front of you was clearly texting and you had to honk at him to let him know the light had changed to green? The fact is, most crimes are crimes of opportunity. The crack-head looking for the easy score is going to approach the person whose head is down looking at their phone instead of having their head up. Also, even though I always carry a gun, knife and tactical pen, it’s not going to do me much good if my head is down giving some guy the opportunity to hit me over the head with a lead pipe or stab me with a knife. Having these tools to defend myself are useless if I’m not aware enough to see an attack coming and therefore don’t have time to deploy one of them. The bottom line is, most of keeping yourself safe in life comes down to paying attention to your surroundings and texting is a criminal’s dream because it makes people easy prey. 2. Time Management - I’m all about using my time productively. I’m able to get a lot of work done, to dry fire every day, and do training because I don’t text all day or immediately run to the phone every time I hear a “ping” sound. If someone needs to get a hold of me they call me and we quickly have the conversation we need to (instead of texting back and forth forever) or they email me and I respond when I get a chance. Needless to say, many people claim to not have enough time in the day to train or to dry fire with their handgun. If they stopped texting, I imagine they could replace that previously unproductive time with training time that has a much higher payoff in the long run. 3. I Think - Many of us are turning into robots who cannot even make a decision without consulting our smartphone. If you can’t survive without your smartphone then you’re not going to do too well if things get truly bad in this country. Now, there are lots of other reasons I don’t text and don’t own a smartphone, including that people store way too much personal information on their phones that could be easily hacked. But, the main reason is for safety purposes and to keep myself from getting distracted. Just remember, you may be the world’s best gunslinger, but if you don’t see it coming and you’re caught by surprise it probably won’t matter. Jason Hanson is a former CIA Officer and author of The Covert Guide to Concealed Carry. He is also the creator of the Ultimate Concealed Carry Experience, which allows you to take your concealed carry training without leaving home.